We were pleased to welcome Dr Jonathan Nichols from the Radio and Space Plasma Physics Group at Leicester University who had come to talk to us about "The Juno Mission to Jupiter: first results". He explained that Juno is a NASA spacecraft that is currently in orbit around Jupiter and is the first solar-powered space probe to orbit the planet as the previous orbiter, Galileo, used nuclear power to function. Dr Nichols began by saying that Juno launched on August 5th 2011 and five years later attained an orbit around Jupiter on July 5th 2016. This orbit of Jupiter takes the craft over the planet's poles and is a highly elliptical orbit taking roughly 53 days to complete. The polar orbit means that Juno's instruments can map the entire planet. NASA had decided on this type of long stretched-out trajectory that only came near the planet for a relatively short section of its orbit so that the craft would not stay long in Jupiter's dense radiation belts. For, Dr Nichols explained that the Juno engineers expected that even the short passes near to the planet meant that the spacecraft and its instruments would eventually succumb to the intense radiation near Jupiter and successive failures would hasten the end of the mission. To avoid contaminating Jupiter's moons Titan and Enceladus where subsurface liquid water may host lifeforms, Juno will be deliberately de-orbited into Jupiter's atmosphere where it will burn up. To try and counteract the radiation damage that the spacecraft would suffer Dr Nichols said that most of the spacecraft's electronics and instruments are within the "Juno Radiation Vault" which has 1-cm thick walls. One instrument that is not within the Vault is Junocam, which is a telescope with a camera that works at optical wavelengths. This was actually included in the mission for members of the public to use to do science as well as general outreach purposes. This camera has already returned numerous images of Jupiter and the photos have been uploaded to the Junocam website so that anyone can look at or even process the images themselves (www.missionjuno.swri.edu/junocam). Dr Nichols then said that the mission had not quite all gone to plan as the initial orbit should have shrunk from 53 days to 14 days. However, this relied on a carefully-timed firing of the spacecraft's main engine to alter the orbit. Unfortunately, some valves within the engine system did not open in a few seconds as they should have but took several minutes and so the flight engineers have recommended staying with the 53-day orbit for the remainder of the mission. Fortunately, this does not hinder any of the science objectives of the mission. Some of the first results include the discovery that the pattern of horizontal atmospheric stripes, known as belts and zones, go deeper into the planet's atmosphere to at least 500 km and are not just a surface phenomenon. In contrast the round storms such as the Great Red Spot are much shallower systems skirting along the top of the atmosphere. 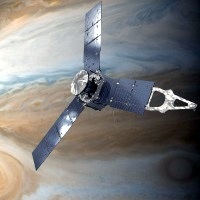 Juno has also found that Jupiter's magnetic field is much stronger and more complex than was predicted.